The BFA in Creative Writing is a 60-credit major that prepares students for professional writing careers. Within the major, 45 credits are dedicated exclusively to writing courses including small, intensive workshops in poetry and fiction. Students also take craft seminars focused on specialized writing forms and genres, literature courses, a hands-on course in publishing, and a cross-disciplinary course requiring close collaboration with a student in another artistic field. In their first year, Creative Writing students acquire a working knowledge of the elements of poetry and short fiction by taking two year-long workshops—Introduction to Contemporary Poetry and Introduction to the Contemporary Short Story—which equally emphasize reading and writing. Here students begin learning to read as writers, to critique material productively, and to hone their writing skills by using as models the significant poetry and story collections of the last fifteen years. As sophomores, students continue to explore and refine their writing interests by taking the Intermediate Workshops in fiction and poetry, as well as choosing from among the diverse roster of craft seminars. These seminars are not literature courses in the traditional sense, but courses that look closely at a particular form or genre with an eye to craft. These electives, offered on a rotating basis, include Creative Nonfiction, Screenplay Adaptation, Speculative Fiction, Translation and Adaptation, and Graphic Storytelling. Juniors, in addition to taking increasingly advanced writing workshops in poetry or fiction (or both), have the opportunity to explore connections between their writing and other arts. In the cross-disciplinary Writing and Collaboration, students undertake a creative project with a student in another major; in Literary Editing and Publishing, students are introduced to all aspects of producing a literary magazine. To complete their degree, students also enjoy 15 credits of free electives, which may be used for additional courses in Creative Writing, editorial internships, or studio programs from across the University. 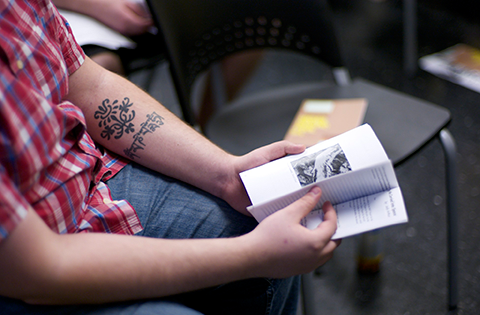 In the senior year, Creative Writing majors take a two-semester seminar in poetry or fiction, concentrated on revising finished work with potential for publication. The senior year culminates in a portfolio of revised pieces, an exit interview with members of the writing faculty, and a public reading.